The “planning for shared mobility conference” will be held next Monday, May 8, 2017, in New York, at Jakob K. Javits Convention Center, organized by the APA, American Planning Association. The conference will give you the opportunity to learn about the role of shared mobility in urban planning. Identify challenges and opportunities for planners, policymakers, and public agencies interested in implementing shared modes and developing shared mobility policy in local and regional governments. Engage with private-sector transportation technology innovators and stakeholders and learn more about opportunities for public-private partnerships. In recent years, economic, environmental, and social forces have quickly given rise to the “sharing economy,” a collective of entrepreneurs and consumers leveraging technology to share resources, save money, and generate capital. Homesharing services, such as Airbnb, and microtransit services, such as Via, have become part of a sociodemographic trend that has pushed the sharing economy from the fringe and more to the mainstream. The role of shared mobility in the broader landscape of urban mobility has become a frequent topic of discussion. Major shared transportation modes—such as bikesharing, carsharing, ridesourcing, and alternative transit services—are changing how people travel and are having a transformative effect on mobility and local planning. 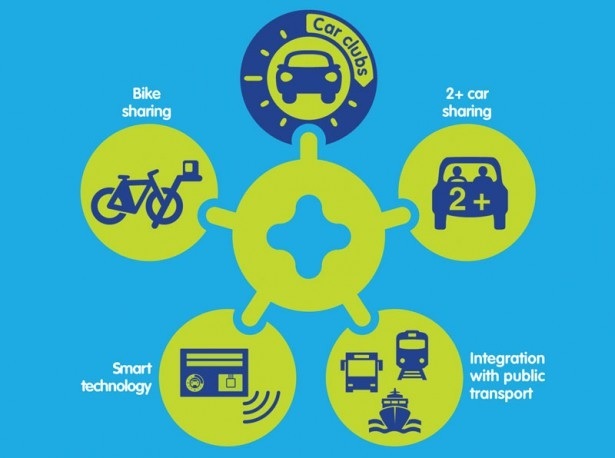 Shared mobility—the shared use of a vehicle, bicycle, or other low-speed travel modes—is an innovative transportation strategy that enables users to have short-term access to a mode of transportation on an as-needed basis. Shared mobility includes various service models and transportation modes that meet the diverse needs of travelers. Shared mobility can include roundtrip services (vehicle, bicycle, or other low-speed mode is returned to its origin); one-way station-based services (vehicle, bicycle, or low-speed mode is returned to a different designated station location); and one-way free-floating services (vehicle, bicycle, or low-speed mode can be returned anywhere within a geographic area). The rise of shared mobility has disrupted existing products and services in the urban mobility space. App-based for-hire vehicle services such as Uber and Lyft have challenged the taxi, livery, carsharing, and mass-transit establishment. Disruptive innovations like this have the power to not only redefine industries but also bankrupt companies. Fundamental changes in transportation are a great challenge and opportunity at the same time—this requires a systemic view of the evolving transformation. Shared mobility directly influences and is influenced by most facets of urban planning. This workshop examines the interdependencies, synergies, opportunities, and challenges associated with shared mobility.